WARNING! YOU CAN DAMAGE OR DESTROY EQUIPMENT IF YOU DON'T KNOW WHAT YOU ARE DOING. Read all of these directions thoroughly, and use the information on this page AT YOUR OWN RISK. Have you ever had to DF and ELT that you couldn't "hear?" You may wish to modify your practice beacon to simulate realistic malfunctions. One of the more difficult scenarios for a DF team is trying to find the carrier-only signal. That means the unit transmits without the ELT-type swept tone. This makes the signal may hard to identify from the noise on nearby frequencies. You may or may not be able to audibly identify a carrier-only signal, but you can tell for sure if you have reliable deflection on your DF set (airborne or ground). DFing a carrier-only ELT is an advanced technique, so only give that to prepared teams. See the SAR Wars Stories for a real-world example of a carrier-only ELT. If you'd like to practice these skills, follow the directions below. This project is not for the faint of heart or for the unskilled. If you wouldn't do this to something you own--don't do it. If you don't own it and you wreck it, you might just have bought it. A practice beacon costs over $150. Step 1. First, you will want to review the Pointer 6000 Circuit Diagram courtesy of Pointer, Inc. It will familiarize you with the layout of the circuit board. Step 2. Next, you need to mechanically access the practice beacon. Remove the six screws from the back of the box with a phillips head screwdriver. Remove the cover and disconnect the battery with a gentle pull. Remove the battery to give yourself room to work. When you are finished with this step your practice beacon will look like this. Step 3. Now you will find that the circuit board and a couple of the wires are glued to the interior of the case. You will need to remove this glue with a knife and pliers. Be careful not to pull on any of the wires as it may disconnect them. The glue that was originally used was "hot glue." This serves to stabilize everything and even help waterproofness. You'll need to remove the glue so you can pull the printed circuit board (PCB) out of the case. You could conceivably do this modification without taking the board out of the case, but it is easier if you do so. Once you've removed the glue, CAREFULLY pull out the board. You aren't going to remove any wires, and the fit will be tight. Don't pull anything loose! Step 4. Next, locate where you will short the sweep generator. Study of the circuit diagram will make this task easier. You will not the large silver patch and the hole, identified by the two red arrows. The blue line indicates where you will short the board. You can see both the front and the back of the board in these views. Step 5. Next you will need to solder wires to each of the short points. I chose to use yellow wires for clarity. You can see my less-than-perfect soldering job here. You must be careful not to let any extra solder to accidentally bridge any points on the back of the board. You can see that there are many places where the circuits are close together. This is one of the places where you can do permanent damage to the beacon. Be careful! Step 6. Because you will want to be able to select whether or not you wish to hear the sweep, you will most likely want to install a switch between the two points identified in the previous step. A closed switch will short the points and disable the sweep. And open switch will allow the practice beacon to operate normally. The complexity of your switch is up to you--you could even just leave the two wires inside the case and open up the beacon every time you wanted to change operating modes. If you have a recent beacon, you will want to carefully remove the label. Here you see the label loosened up so that its ready to pull off. Step 7. Drill a hole large enough to mount your switch. I chose to use the black spot you see highlighted here. This is actually used for a port or a switch on the "real" models of the Pointer ELT (such as the 3000 or 4000 series). Carefully push aside the white coaxial cable and drill your hole. My switch required a quarter-inch bit. Be careful as you punch through as you don't want to ruin the face of your practice beacon. Its a good idea to drill the hole undersized at first and then move up to the required diameter. This allows a little slop for error (if needed) and will also leave a cleaner hole. Step 8. Here you can see what the switch looks like from the front. I chose to arrange it so the switch is shown in the closed position. This way it conforms to the convention of the master switch, seen below. Flip both switches to the right and that means, "beacon on, sweep on." With the top switch to the left (closed, as shown) it means "sweep off." I will next label the switch "SWEEP" with a label maker. Step 9. Finally, solder the other ends of your wires to your switch. Because of the increased current warning as annotated in the circuit diagram, I also installed a 220 ohm resistor inline with one of the shorting wires. This is optional, but may help to save your battery. You can experiment with different value resistors, but if you go too high the sweep will not be inhibited. I found this to be the case at 1,000 ohms, but it will probably occur sooner and it also will probably vary with the strength of your battery. After you're complete with this, connect the battery and close everything up in the reverse order that you opened it up. Test your beacon by turning it on and flipping the sweep switch back and forth. You should hear the sweep go away while shorted and come back when open! Of course you'll need your trusty Little L-Per, Jetstream, or other receiver to hear the signal on 121.775. Next, try DFing it and have your friends do the same! "PULL LOCKING SWITCH LEVER WHILE CHANGING POSITION"
Apparently this sentence written in plain English isn't plain enough for some individuals. Sooner or later its almost a given that your practice beacon will have its master power switch broken off by someone who thinks, "if it doesn't move ... push harder!" So far my personal beacon still has its original switch, but I've been in at least two squadrons where the switch had to be replaced--luckily that task has only fallen to me once. Training will help prevent this problem, as will not allowing the beacon to be handled by anyone untrustworthy. Interestingly, most real ELTs don't have a locking-type switch. Instead they have a 3-position switch (ON, ARM, and OFF). Once you have a suitable replacement switch, refer to the photos above to locate the backside of the switch. Unsolder the wires from the switch. Unscrew the switch from the front of the beacon and install the new switch in its place. Be sure to orient the switch properly so that the closed position corresponds to "on" on the front of the beacon. Solder the wires back to the switch. If you short the capacitor shown here, your practice beacon will transmit a single-tone that is moderately pitched in comparison to the familiar sweep. This is different than the carrier only sound, which sounds like "silence." A carrier only signal sounds like someone has depressed a microphone on a two-way radio but isn't saying anything. You get your practice beacon to transmit carrier-only by performing Modification #1 on this page. Like the other mods on this page, you could wire a switch to the short, with closed being the modified tone and open being a normal sweep. This mod makes for an interesting "broken ELT" type sound. Many users wish to power their practice beacons by something other than the batteries provided by Pointer. Please note that doing so will void your warranty! 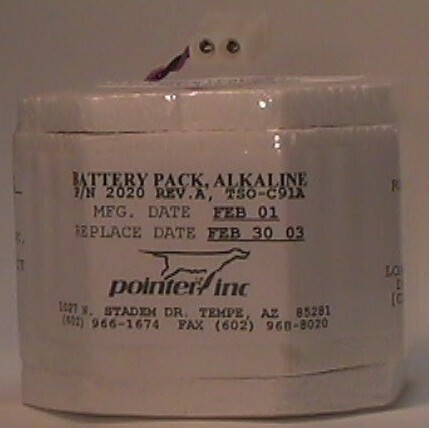 The original battery supplied by Pointer is a "real" ELT battery and will therefore have an expiration date. The original battery is Part Number 2020, and costs around $25 - $35 US. You will find that this battery will generally last a long time. Additionally, the supplied alkaline battery pack specifically designed to endure short term extreme thermal variations and mechanical shock. The bottom line is that it is a good battery, but is expensive over the long haul. Since it is usually much easier and cheaper to pick up batteries from your local retailer, modifying your beacon to use a different power source may be for you. There are a great number of options available to power your beacon. If you wish to have a new battery, another ELT manufacturer makes batteries for Pointer ELTs. The manufacturer is Artex, Inc., and the part number is 00-30-006. A very good option is to use expired batteries for real ELTs. ELT batteries must be periodically replaced by an aircraft maintenance technician. If you ask around at your local airport's Fixed Base Operator (FBO), the mechanics there may be willing to donate the expired batteries that they remove from actual ELTs. Providing they are the same type, they will work wonderfully in your Practice Beacon. It shouldn't take too much convincing for the FBO since they would throw these batteries away otherwise. In fact, they likely will not have any lying around and will have to specifically save them for you. Please note that if you are disposing of ELT batteries in bulk that they are considered hazardous waste and need to be disposed in an environmentally friendly way (by law). If you use the battery supplied by Pointer or another ELT battery, you will not be able to modify the power output of the beacon. Pointer even talks about home-made battery packs and some of the options you might want to consider on their Pointer 6000 web page. This short page also discusses the frequency reassignment that was required more than a decade ago. In summary, it states that in designing a power source you should use 8 volts maximum. At 7.5 volts, the nominal power output of the beacon will be 150 milliwatts. The original batteries supplied by Pointer test at 7.5 volts as well. You might wish to note that by specification the power output of most ELTs is 100 milliwatts (TSO C-91 and C-91a beacons ELTs), and 25 milliwatts for 406 MHz ELTs (TSO 126). To simulate a beacon that is transmitting at low power, Pointer suggests using a 6 volt power supply. They further suggest that you can shorten the telescopic antenna to simulate a broken antenna. If you're still reading this and your eyes haven't glazed over, you likely already know that a fresh AAA, AA, C, or D cell alkaline battery supplies approximately 1.5 volts. Therefore, for a 7.5 volt battery back you will want to use 5 batteries in series. For a 6 volt battery back you would want to use 4 batteries. Rechargeable batteries (such as Ni-Cads) typically output 1.2 volts apiece, so adjust your planning accordingly (5 x 1.2 = 6.0, 6 x 1.2 =7.2). Of course, D cells will last longer than the other types. D cells may also be more likely to give sufficient voltage in cold weather. D cells can be rapidly replaced, are readily available just about anywhere (such as the gas station at midnight), and are small enough that you should be able to fit a spare set inside of an ammo can setup. Begin by unscrewing the back panel. Use a voltmeter to ensure the polarities between your battery pack and the original battery match. If you improperly connect the wires, you will damage the practice beacon. Of course, you should be able to determine positive and negative terminals from the way the original batteries are shaped. It is always better safe than sorry, though, so run the voltmeter. Using this option allows the most portability of the beacon. Externally the beacon will be identical to a new beacon as shipped from the factory. This will allow for the easiest use as well. A battery holder for AA batteries will fit inside the case. Unless you fabricate a battery pack as shown below, that is just about the only option (excluding, of course, the standard p/n 2020 battery from Pointer). Option 2: Place the power source outside the beacon housing. This is the most common option. You will need to solve several problems for this to work well. First, you will need to determine how you will run wire from inside the beacon container to your battery pack. You will probably have to drill a small hole in the casing of the Practice Beacon to admit the wires. This will compromise the waterproof seal of your practice beacon, so liberally apply hot glue or another sealant if this is important to you. You could also mount a barrel-style power adapter that can connect directly to the beacon. For example, Radio Shack part #274-1563, "DC Power Jack, panel mount, Size M." You will be able to find the electronic components listed on this site at an decent electronic parts house, to include internet catalogs. Radio Shack part numbers are included because a Radio Shack store can be found nearly anywhere in the nation. This option allows the practice beacon to run off the internal battery when disconnected from external power and also has an external adapter (as described in the Option 2) to allow for charging OR to power the beacon, depending on your design. The CAP Emergency Services Resources™ website is aware of a modification that allows a user to plug in virtually any low DC voltage (6 - 35V) to power the beacon and also automatically isolates the battery. This information will be provided as it becomes available. Since your battery pack is outside of the beacon for options 2 or 3, you will need a method of keeping everything together. An excellent idea is to construct a Practice Beacon Box from an ammo can as outlined on this site.You must also choose what will power your beacon. In addition to AAA, AA, C, and D cell batteries, you may also use a 6 volt lantern battery. The advantage of this battery is that you only have to deal with the single cell and you don't need a holder. Speaking of battery holders, if you wish to use the 5 D-cell configuration, you would probably like to know that Radio Shack carries battery holders for most battery sizes. For example, a single D Battery Holder: Radio Shack Part #270-403 and a 4D Battery Holder: Radio Shack Part #270-396. Arrange multiple holders in series (if required). Run the wires from your battery assembly to the Practice Beacon. If they are not long enough to mount them in the box, add additional wire. You can use the molex-style wire connector from the old batteries to the new standard battery holder. This facilitates easy swapping of battery packs. 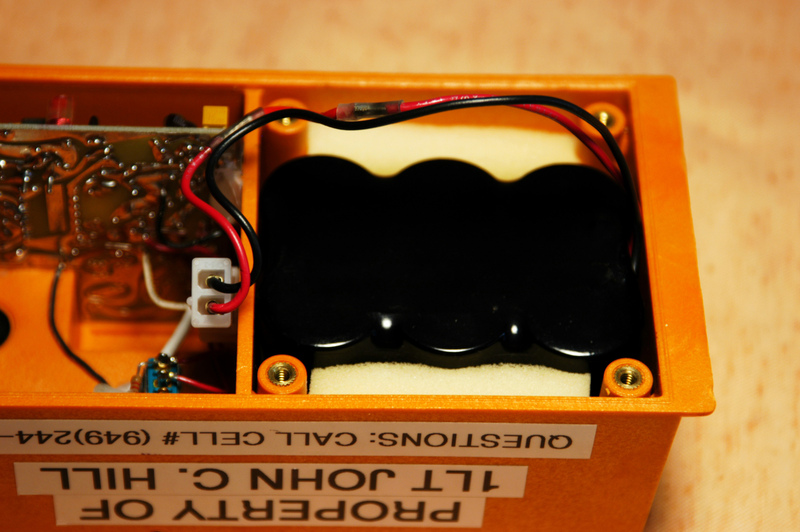 When complete, you will wish to secure the battery pack inside your beacon box. Hot glue or velcro are good options. The following is an excellent example an elegant solution using rechargeable batteries. This information was submitted by 1Lt John C. Hill, CAWG Group 7 ES Officer. Many thanks, John, GREAT WORK! The battery pack consists of six(6) SANYO N-3000CR "C" cells. These are 1.2 volt NiCAD batteries that, connected in Series, add up to 7.2 volts. The Series Connections between batteries are thin metal straps that are spot welded in place. Any battery pack company (for example, "Batteries Plus") will be able to do this spot welding using a desktop welder. This machine is only about the size of an espresso maker. Welding should cost about $5. That should also cover professional soldering of the pigtails, and application of heat shrink wrapping of the whole assembly. Including the cost of the batteries, the whole thing will end up costing about $50. There is no performance data yet for how long the beacon will last between charges. The molex-style battery connectors can be found in an AMP 618-2 package. This package contains two (2) male/female and socket/pin pairs. You might end up with more connectors than you need, but they're cheap. The package is identified as TYCO / Electronics, AMP, General purpose Connectors, 2 Position Free-hanging 20-14 AWG, And is distributed by GC/Waldon. There are two Part Numbers on the back, AH1680 and 05165. Your local parts supply house or an AMP catalog will yield the individual male connector and sockets required to mount to the practice beacon. Currently the beacon must be opened to recharge the battery pack, but 1LT Hill is working on an external connector as described in the options above. This will allow an external charger to be plugged into the POINTER 6000 without having to take it apart. A MAHA 777+ charger could be plugged into the power connector or even a standard wall-cube type module power supply. Isolation of the battery for charging is being examined. Note the close fitting of the battery pack in the photo above. Also note the nice detail of adding the foam to stabilize the battery pack. Thinking about converting a real ELT into a practice beacon? Read this--from the Chief of CAP Comm--first! The answer is "no". You can't convert a real ELT for practice purposes. The reason is because of the fact that ELTs are intentionally "sloppy", transmitting a healthy signal on the first harmonic so you can track on either 121.5 or 243.0. The practice beacons have filter circuitry to eliminate the harmonics so we can use them on 121.775 without stepping into the unauthorized 243.55. So, if someone were to recrystal a real ELT to 121.775 they would be in violation of our frequency assignments because we don't have an assignment on the UHF number. Now, that having been said, Fred has submitted a request for the Joint Frequency Managers (DoD) to allocate 243.55 as an ELT training frequency but that hasn't happened yet. If they ever get around to doing that, then this gentleman's idea would be legal. Since we now have UHF "Trackers" a UHF training frequency would be helpful. Thanks for checking. Let us know if there's anything we can do. The question was asked to other industry experts. They indicated t that most often the bench time would often cost more than a new Pointer brand practice beacon. Professional conversion would be required to maintain the type acceptance of the radio. In other words, shell out the $156, which includes shipping. You may purchase the beacon directly from Pointer. Future Mod: While you're on the inside of your Pointer, you can also eliminate that telltale light. Simply wire in a switch to one of the wires. Eliminating the light will allow your batteries to operate longer and the light is unnecessary inside your ammo can anyway. Future Mod: The rate of the tone sweep should be able to be controlled by the voltage into the tone generator. In this case, you would want to solder in a pot (potentiometer) to the supply line. I don't know if this has been successfully tried--someone please let me know! Future Mod: Hook a solar cell to the beacon to charge/power the unit during daytime training. Future Mod: Add a DTMF controlled circuit so you can turn the beacon on and off remotely. When this is combined with a solar cell, it allows the beacon to be left out in the middle of nowhere for extended periods. Other folks have put automatic timers on their beacons--not a bad idea. It might be a wise idea, however, to mark the position of the beacon by a GPS or other very reliable means of navigation, lest you lose your beacon when it ceases to transmit unexpectedly.